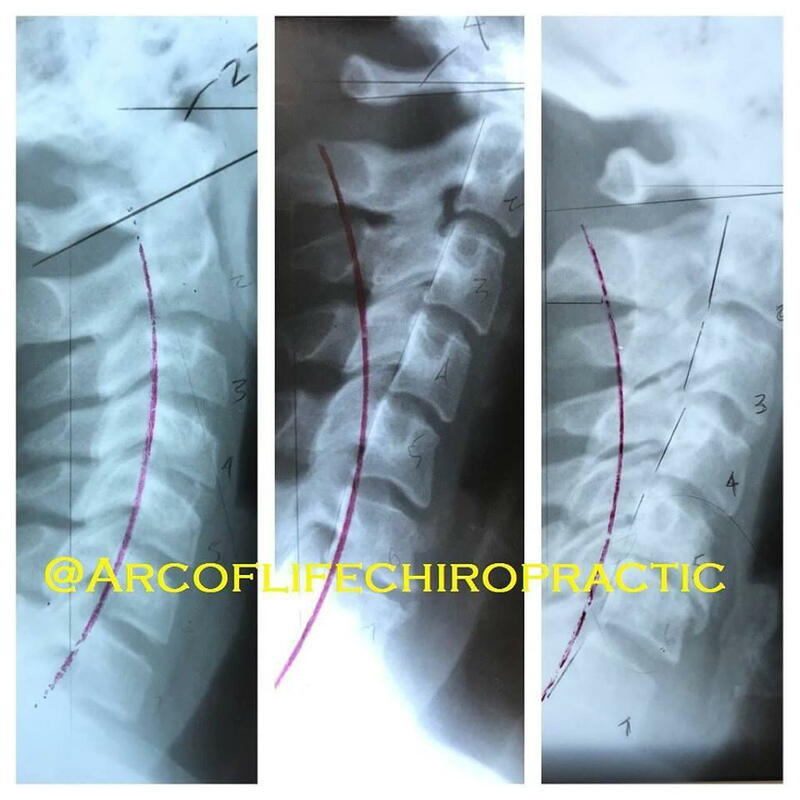 The Arc of life is the 43 degree curve in a textbook normal cervical spine (neck). In the pictures above they represents the red line that is posterior to the vertebrae. Do you know if your neck has that 43 degree curve that is necessary to maintain great neurological communication? Most people by the age of 25 have lost most of their cervical lordosis (neck curve) due to a variety of reasons: trauma, texting, studying, and bad postural mechanisms. The alignment and curvature of the spine is crucial because it allows the nervous system to function as optimally as possible. The arc of life is where the mental impulses travel from the brain to the rest of the body. The loss of curvature in the neck can often lead to a disruption in biomechanics and worse neurological damage. Over the course of time the neck tends to move anteriorly and create muscular strain as well as impede the messages that are relaying from the brain down the spinal cord to the rest of the body. On average, a human head weighs about 10-15lbs with our ears directly over our shoulders. The curvature is designed to evenly distribute the weight of the head on the neck. With each inch the ear is forward it creates approximately 10 pounds extra pressure on the intervertebral discs. Intervertebral discs are the unique fibrocartilage located between each vertebra that act as a shock absorber and allows for motion between each vertebrae. I challenge you to hold a ten pound bowling ball close to your body for one minute and then hold it a tiny bit further away from your body for another minute. Which minute is harder to maintain? When you hold the bowling ball a little further from your body it parallels what is exactly going on in your neck. As your neck falls forward your muscles are working twice as hard to maintain that normal posture. Unbeknownst to a majority of people, they are lacking the lordotic curve in their neck but do not know it until they experience neurological complications and symptoms. Anterior forward head carriage symptoms include but are not limited to: headaches, neck pain, shoulder tension, migraine headaches, and decreased range of motion. So what does your body need then? It needs to restore the ARC OF LIFE. X-rays of the cervical spine will tell you exactly how far anterior your neck is and your chiropractor can do that for you in the office. Your chiropractor will also perform specific chiropractic adjustments and give you appropriate exercises and therapies in the office and at home. In our office at Arc of Life Chiropractic starting April 2018 we will be getting brand new state of the art digital x-rays. Come in and see what your spine looks like!